It is a meat that is rich in monounsaturated fatty acids, mostly oleic acid, making up 38% of its total fat. This type of meat contains high bio-availability proteins, zinc and iron, plus B-vitamins. Pork is not necessarily fattier than other meats. A study from the United States Department of Agriculture reveals that some pork cuts have fat levels similar to some meats we usually call lean, such as chicken. By the other hand, if we assess pork in terms of its cholesterol, we can see that pork loin is healthier than its equivalent of beef and veal, and even skinless chicken. 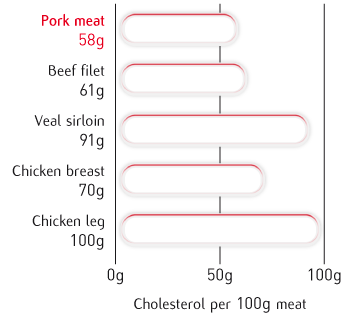 Pork can therefore be considered relatively low in cholesterol. Compared to other meats, pork loin, for instance, is leaner than skinless chicken thighs (data from the US Department of Agriculture) and as lean as skinless chicken breast. In addition to that, pork has proteins, B-vitamins, phosphorus and zinc, all of which are essential nutrients. It has less sodium than beef, being a good ally for those who suffer from high blood pressure. More good news for pork fans: pork fat remains concentrated under the skin, which makes it easy to isolate. In beef, it is more interspersed in the meat fibres.